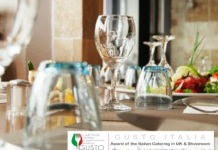 At the Dolce Vita exhibition in London there are plenty of Italian products, all of high quality ‘. 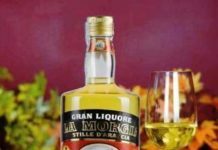 The Italian products are known worldwide for their freshness, goodness and fragrance. 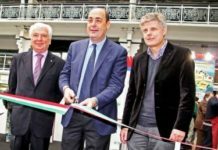 At the Dolce Vita 9 to 11 March in London, you can taste the original products of the region ofItaly, as you can find products, mozzarella, pecorino, doc wine, salami, and you can test andtry these products in a relaxed atmosphere. but how do you make Italian cheeses such as pecorino and mozzarella? For the mozzarella there is legend, was first made when cheese curds accidently fell into a pail of hot water in a cheese factory near Naples…and soon thereafter the first pizza was made! Actually, new cheeses are often formulated when mistakes happen, so there well may be truth in the tale! 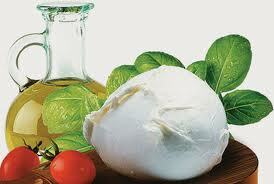 Mozzarella was first made in Italy near Naples from the rich milk of water buffalos. Because it was not made from pasteurized milk and because there was little or no refrigeration the cheese had a very short shelf-life and seldom left the southern region of Italy near Naples where it was made. As cheese technology, refrigeration and transportation systems developed the cheese spread to other regions of Italy. However, to this day it is widely known that the best and most highly prized artisanal produced buffalo mozzarella is still found south of Naples near Battipaglia and Caserta where small factories continue centuries-old traditions making buffalo mozzarella fresh daily for their local customers, who line up at the factories to buy this delicacy. The peculiarity of this cheese is entirely due to the technology used in its traditional preparation. It is produced exclusively from whole buffalo milk and, after drawing and moulding, may also be smoked, but only using natural, traditional procedures.Buffalo milk is not for drinking and is used exclusively for making mozzarella. Indeed, it is so nutritious and so rich in fat and cassein that it would be indigestible over the breakfast table, whereas it is the best for the cheese industry. Cow’s-milk mozzarella is a ball of fresh cheese swimming in brine, pleasant as ice cream but absolutely tasteless. Made out of buffalo milk, instead, it becomes an altogether different matter. By visiting one of the many small dairies scattered over the district between Caserta and Salerno, you can see the way mozzarella is made, which is a very fast process. The milk is brought in, curdled, then drained to eliminate the whey. After this the curd is cut into small pieces, then ground up in a sort of primitive mill. At this point, reduced to crumbles, the curd is put into a mold and immersed in hot water, where it is stirred until it takes on a rubbery texture. The cheesemaker kneads it with his hands, like a baker making bread, until he obtains a smooth, shiny paste, a strand of which he pulls out and lops off, forming the individual mozzarella (“mozzare” in Italian in fact means to lop off). These in turn are put into cold water and then to soak in brine. The cheese absorbs as much salt as is necessary and has to take on consistency. In the end, it must not be soft and mushy when cut but fibrous and elastic, so that if poked it springs back to its original shape. Mozzarella, prepared in the evening is ready the next morning, oozing with freshness and richly flavored. Fresh mozzarella is generally white, but may vary seasonally to slightly yellow depending on the animal’s diet. It is a semi-soft cheese. Due to its high moisture content, it is traditionally served the day it is made, but can be kept in brine for up to a week, or longer when sold in vacuum-sealed packages. Low-moisture mozzarella can be kept refrigerated for up to a month, though some shredded low-moisture mozzarella is sold with a shelf life of up to six months. Mozzarella of several kinds are also used for most types of pizza and several pasta dishes, such as lasagna, or served with sliced tomatoes and basil in insalata caprese.